A few days ago, I heard a recording of an individual called Khalid Abdur-Rahman Al-Misri wherein he exposes himself as a reckless, self-conceited ignoramus by passing judgements unjustly against Scholars of the Sunnah and specifically against our Shaikh, the ‘Allāmah, Rabee’ Ibn Hādi ‘Umayr Al-Madkhali (حفظه الله). In this lecture, he claims that some of the scholars of Ahlus-Sunnah such as Shaikh Rabee’ have deviated from the Sunnah and have shown agreement with the stance of the Khawārij due to them issuing fatāwa in affairs that revolve around fighting and war in other lands. He makes clear that his criticism is directed primarily at Shaikh Rabee’ though he does allude to other scholars as well. He accuses them of deviation from the Sunnah and deviation from the foundations of the Religion. He states without shame that “Shaikh Rabee’ has deviated from the Sunnah and has agreed with the saying of the Khawārij.” No amount of flowery speech can mask this blatant attack against the Scholars of Sunnah, and specifically against one of the Imāms of the age, Rabee’ Al-Madkhali. 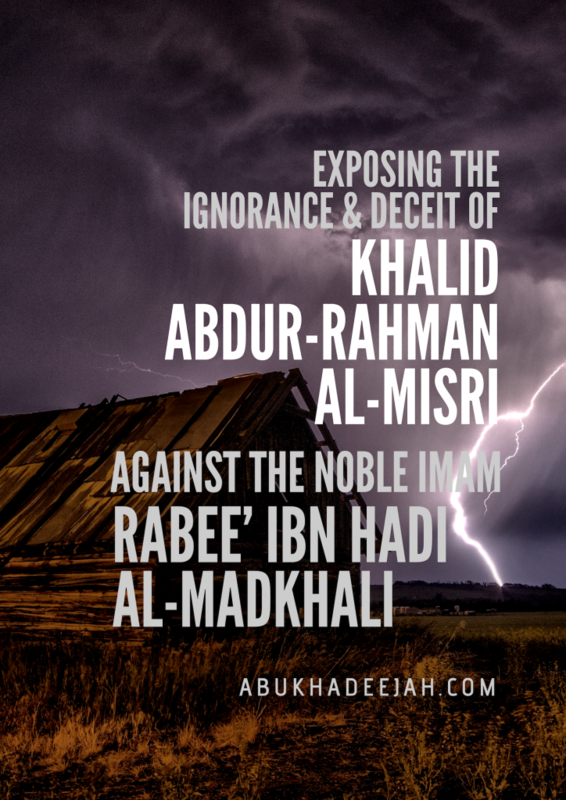 This lecture was posted and remains posted on the website of the party of Khalid Al-Misri, which is further proof that there is small band of inciters with him who encourage each other to challenge the scholars of Hadeeth and Sunnah seeking to belittle and dislodge them. 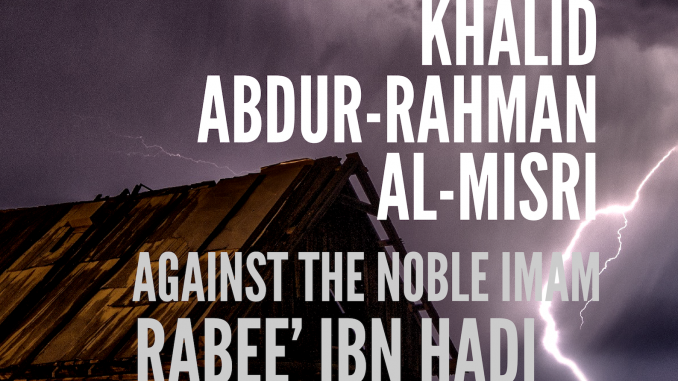 The following short article addresses and challenges the accusations and false assertions of Khalid Al-Misri (and his allies in deceit) that he has aimed at Shaikh Rabee’. Though this article is in English, these same questions have been posed to Khalid Al-Misri in Arabic, and he has not responded, nor recanted, nor repented. Khalid Al-Misri and his group challenge the well-known and established position of the Sahābah and the great scholars which states that those in authority (ūlul-‘amr) include the scholars along with the rulers, each with a responsibility to shepherd the Ummah. I will discuss this later in this article, inshā-Allah. Khalid Al-Misri himself admits that he walked with Jama’at At-Tableegh for over fifteen years before Allah guided him to the Sunnah through the scholars of the Salafi da’wah – so it is upon him to fear Allah and know his small station and not fabricate falsehood against the mountains of knowledge. A small goat that butts its head against a mountain should have mercy on its own head more than on the mountain!